Thanks for stopping by! 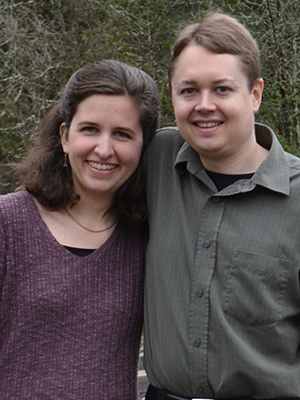 My name is Katherine [Loop] Hannon (Kate for short), and Christian Perspective is an online ministry where I (and now also my husband, Dr. Adam Hannon–I got married in early 2019) try to share encouragement and resources from a Christian perspective (i.e., a biblical worldview). We send out new content as we’re able—which is usually not as often as we’d like. However, we’re trying to be more regular, so hopefully you’ll hear from us around once a month. If you subscribe to our newsletter list, you’ll keep up to date with the latest—and I’ll even send you a free book of short stories. And please join in the conversation on the blog, Facebook, Twitter, YouTube, and Goodreads. Over the last decade, I’ve been honored to share on teaching math from a biblical worldview, along with various other topics. I love helping parents understand the worldview battle in math and be encouraged that the God who created it can help them teach it. Practical information and helpful ideas are presented within the framework of the big picture of how biblical principles truly can transform our view of math. Both in math and other topics, my workshops also include honest looks at the struggles I and my family have had—and at the truths and reality of God’s grace that’s offered to us all. I’m a sinner saved by grace through Jesus Christ. I’m also a writer—I’ve been writing ever since I could hold a pen. I can’t not write. In addition to the short stories, articles, and devotionals you’ll find on this site and in my free newsletters, I’ve written two books on teaching math from a biblical worldview and a junior high biblical worldview math curriculum. I started this online ministry when I graduated homeschool in 2003; since then, I’ve been blessed to travel and share on different topics with homeschoolers (see workshops) across the country and abroad. I also directed publications and marketing for my state’s non-profit homeschool organization for a time, and to work for ParentalRights.org. I have a marketing degree and enjoy communicating important messages. On a different note, I teach piano, and enjoy baking (or should I say experimenting in the kitchen? ), reading, and spending time with friends and family. I’ve dabbled in making videos (here’s a free short documentary I produced with a friend), worked at a bakery, and been that weird girl who leaves a library with a stack of math books. I’m always learning something new, and discovering how much more I have to learn. My favorite thing to do is to talk with people about God and His Word. After all, all our biographies will end with seeing Him face to face. I’m a mess saved by grace. I’m also a scientist–which, among other things, means I track data on everything and report every detail when I describe the events of a given day. I’m also an engineer–which means I use math and science to help design solutions to a variety of practical problems. I’ve long had a passion for math and science, and see both as proclaiming God’s praises. By God’s grace, I obtained a doctor of science (ScD) degree in materials science and engineering from the Massachusetts Institute of Technology after obtaining bachelor of science (BS) degrees in both physics and polymer & fiber engineering from the Georgia Institute of Technology. I did my postdoctoral research at the National Institute of Standards and Technology (my research was on simulating the self-assembly of complex polymer systems and incorporating advanced inverse algorithms and physics-based models into X-ray characterization techniques), and now work at FraudScope, Inc. as a data scientist, using advanced algorithms to aid in the detection and prevention of healthcare fraud. On a different note, I enjoy performing gospel and Christian hymnal music and am a bit of a foodie. I enjoy intellectual discussions on just about every topic, playing games, and talking with others about God. I love spending time with friends and family…and now with my amazing wife! I am super excited about all God has in store for Kate & I…including working together on various math projects here that we hope will help others see God’s handiwork in math and science. The Bible, from beginning to end, is Gods inerrant Word. It is accurate in all subjects including those spiritual, historical, and scientific. The Bible is Gods infallible love letter to us, reveling Gods nature and our need. God is the Almighty, Holy, Omnipresent, Omnipotent, Triune Creator. God created all things in six 24-hour days, as set forth in the first chapter of Genesis. All things were originally very good, or perfect. No sin or death marred Gods original creation. The first man and woman (Adam and Eve), and through them all mankind, rebelled against God’s rule and chose to rule their own lives. The Bible calls this rebellion and I-centeredness sin. There is nothing good in a man. Sin is who we are, not merely a list of what we do. The penalty of sin is death. We are all guilty; we all deserve to die. Sin has caused a huge chasm between man and God. A holy God has nothing in common with sinful man. No human effort can bridge the chasm that exists between man and God. Sin has also caused death and disease to mar God’s perfect world. God graciously had a plan to redeem us out of our hopelessly sinful state. Jesus, God the Son, came and paid the penalty for sin. The gift of the cross is that by belief in the Son, righteousness is imputed to the believer and salvation is granted because of Jesus’ merit alone. Jesus finished the work for our salvation on the cross. God the Son died, was buried, and rose again on the third day. In rising from the dead according to the Scriptures, God has accepted Jesus finished work on the cross. The believers role in sanctification is trust and abiding. The believer is eternally secure because of what Christ did on the cross, and is given Christ’s Spirit as a deposit. We are to continue to live as we were saved–trusting in Christ and depending on Him constantly. Jesus is coming back again. The Bible warns of eternal death and punishment in Hell for those who will not accept Gods plan of salvation but seek to save themselves, and promises eternal life in Heaven for those who place their trust in Jesus’ finished work. You can reach Christian Perspective via email (info@christianperspective.net) or follow us on Facebook. Unless otherwise indicated, articles are written by Katherine [Loop] Hannon, (C) 2003-2019. Where marked Adam Hannon, articles are written by Dr. Adam Hannon, (C) 2018-2019. Where marked Cris Loop, articles written by Christina Loop, (C) 2013-2017. Unless otherwise indicated and where marked KJV, Scripture is taken from the King James Version. My goal is to share resources with others, so I’m usually delighted to allow reasonable reprint requests of material shared on this site with appropriate attribution. Some of our short stories have been shared around the globe and even translated into other languages. Just send an email to me at info@christianperspective.net explaining what you’d like to reprint and where, and I will get back with you. Throughout this site, I’ve shared resources & linked to ministries I think might be of help to others. Please use your own discernment as to whether they’d be a blessing to you—a mention here does not mean a whole-hearted endorsement of everything they contain. This is to comply with FTC regulations regarding blog reviews. I, Katherine Hannon, do at times receive products to review on my blog, Math from a Christian Perspective, as well as in other print and online media, such as www.ChristianPerspective.net. The monetary value of each product varies and may be furnished upon request. When I receive a product to review, I do send the company the review ahead of time to preview and will subsequently make changes if I have made an error; however, the reviews reflect my own observations and thoughts. I do occasionally participate in affiliate programs. I review products I feel parents will want more information about–these include both products I want parents to know about, as well as products that are popular in the homeschool community or that someone has asked me about. Selection for review does not constitute an endorsement or recommendation unless one is specifically stated within the review. Recognizing that different people have different needs and preferences, I try to write my reviews as fairly and graciously as possible, while pointing out things parents may want to be aware of before purchasing. I would ask readers to keep in mind my perspective–I am evaluating resources based on how I see them as working within the framework of teaching math from a biblical perspective. I have not used each product in its entirety, but rather examined various parts of it in order to get a general idea. My goal is to offer an overview of the product that will help parents know if it will work for them.